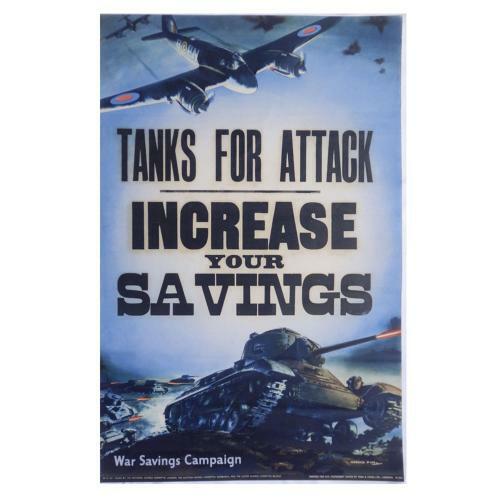 Striking original wartime poster by Harold Pym, "Tanks For Attack - Increase Your Savings". Paper, approximately 48 x 75cm. Issued by the National Savings Committee, London, The Scottish Savings Committee Edinburgh and The Ulster Savings Committee, Belfast. Printed for H.M. Stationary Office by Fosh & Cross Ltd., London. The image shows RAF Beaufighter aircraft and Army Tanks advancing. Minor wear but in very good '+' to excellent overall condition. The British artist Harold Pym studied fine art in London and produced what have been described as ‘famous morale-boosting posters' for the Ministry of Information during WW2. Stock code BO4299.